The completed loco as a teaser for what is to follow in the description of this project. This is a high resolution photo. Right click it in your browser and choose "View Picture" or similar to view it completely or alternatively download it. Even before I started building my NGG16, a long living love of mine, I already eyed towards the Australian Class 60. This class may not be the biggest Garratt ever, but there is little to surpass this class. Actually I believe it to be the largest standard gauge Garratt built in substantial numbers. I got a DJH kit via my modeller's network (thanks again Trevor and Andy!!) in May 2011 and started the kit almost immediately after finishing the then running projects, the NGG16 and parallel to NS Class 6200. It is awesome to see them at work . Double headeding a Wangi bound coal train,1968. 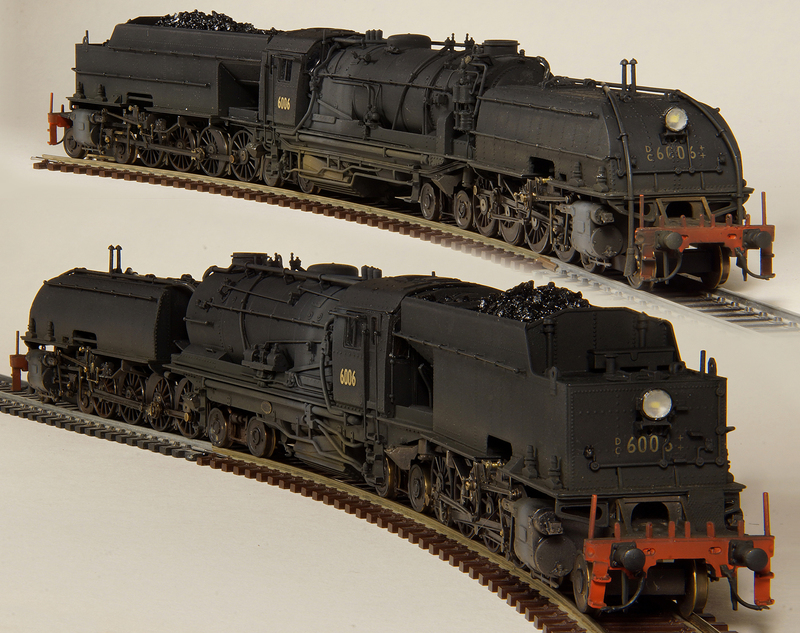 While a was building my model of the AD60 no 6029 was being restored to operational condition. When it finally came to life it featured as the largest operational steam locomotive in the southern hemisphere, the UP3985 being the largest of the northern hemishpere and in fact the largest in the world until "Big Boy" UP4014 hits the rails somewhere between 2016 and 2018. Numbered 6006. Painting about halfway done. I am not happy with the boiler's black coat (too rough). The loco is essentially completed. Some minor jobs are needed to undo minor handling damage. But it runs and it runs sweet. After completing my SHM 26 and NS 6228, progress on the AD60 picked up really well. The rear unit's chassis is operational. 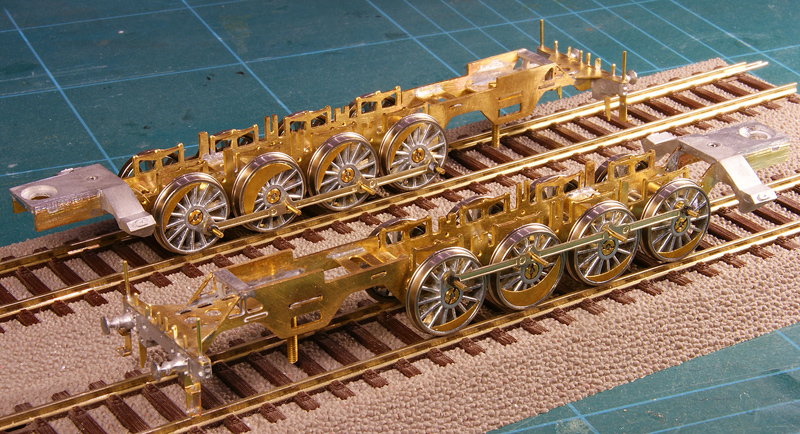 The last set of valve gear of the front unit is awaiting arrival of spare parts. Decals and brass number have been ordered. In the mean time I am working on small details. Many things have passed. Midway 2014 I picked up this model again and gradually advanced to this stage. 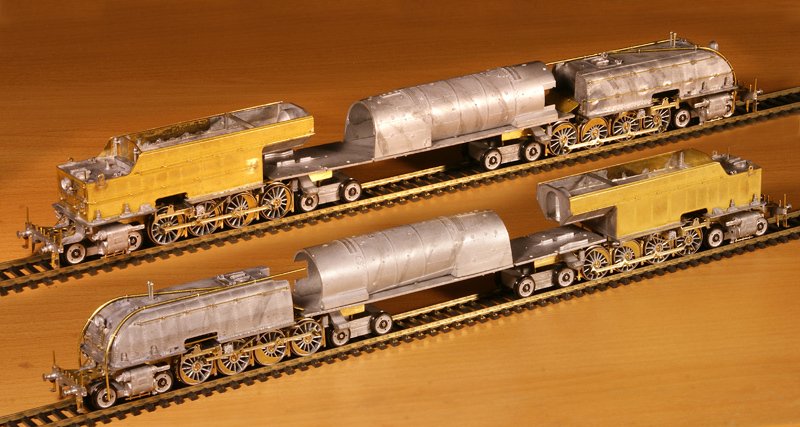 Both undercarriages have been blackened and lightly weathered. Work has concentrated on the drive, progress up to instruction 86 in the manual except mounting the gear boxes. Loosely assembled for the sake of the photo. I need to update the progress on this site but work and family jointly keep me from it. There does not seem to be much difference with the previous status, but a lot of work has been done. The frames are soldered together and a lot of detailing has been done. Current position: instruction 44 in the manual.